What would you rather do: Let your house go into foreclosure or allow someone to turn it into an enormous advertisement? The folks at Adzookie – but perhaps not your neighbors - are hoping you’ll pick answer No. 2. 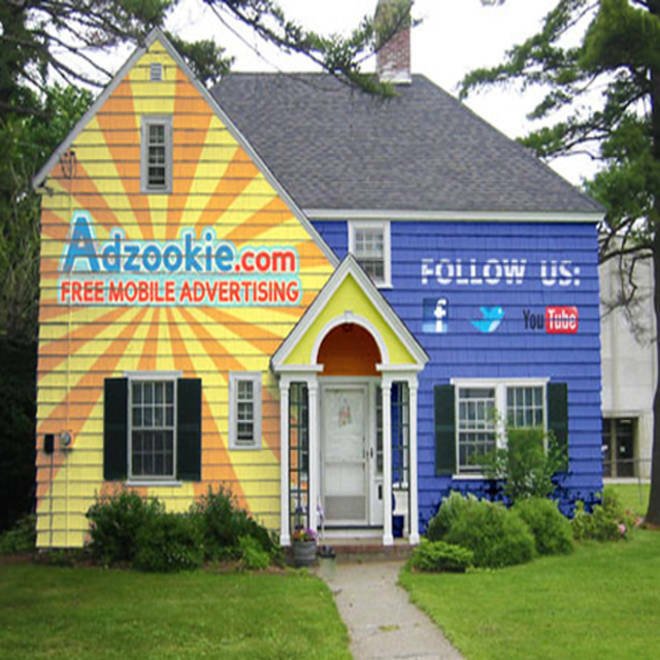 The mobile advertising network recently announced on its website that it was looking for people willing to turn their homes into billboards. In exchange, the company said it will pay the person’s mortgage for as long as the house remains painted. Adzookie said it is looking for a minimum commitment of three months, and perhaps up to a year. Romeo Mendoza, Adzookie's founder and CEO, said he sees the idea as a way to help cash-strapped homeowners and spread the word about his young company. He said he originally intended to paint 10 houses. But he received thousands of responses immediately after posting his plea. He's now hoping to find other advertisers willing to join in on the gambit so he can fund 100 billboard/houses. The company hopes to start painting the billboards in a couple of weeks or so. From the looks of the website, this isn’t a company that’s going for the understated. The prototype shown there is painted bright orange and yellow, with a nice contrasting bright blue thrown in for good measure.